Yamashita Off to Good Start in Meijin Defense: The first game of the 39th Meijin title match was held at its regular venue, the luxury traditional hotel and restaurant of the Chinzanso in Tokyo. Challenging the Meijin, Yamashita Keigo, was Iyama Yuta, the monarch of Japanese go, who was not only after revenge for losing the Meijin title to Yamashita two years ago but also seeking to become the second player to hold the Triple Crown of Kisei, Meijin, and Honinbo. The Meijin title match always starts in September, which is when the weather starts to cool down a little after the usually unbearable summer but which is also typhoon season. In fact, the weather in Japan this September has been very turbulent, with record rainfalls and unfamiliar tornadoes ripping through residential areas. The opening day of the game was not an exception, with a violent thunderstorm at dawn. The players were insulated from the weather, of course, but the game was not. With move 32, Yamashita made an aggressive cap that he later recognized was a bit of an overplay. It was redeemed only by a badly timed cut made by Iyama on move 53 that turned out to be more of an overplay. The ensuing fight eventually dragged in half a dozen groups, with the focus on a large capturing race. This looked bad for Iyama, but instead of being obstinate, that is, going all out to capture Iyama’s group, Yamashita cleverly engineered a large-scale trade that gave him a win. 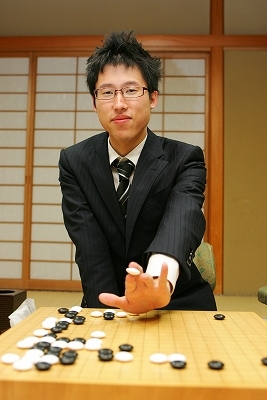 Iyama was forced to resign after 172 moves. This was an uncharacteristic loss for Iyama, with a miscalculation of the balance of the trade thrown in later in the game on top of his earlier overplay. However, a best-of-seven gives him plenty of time to make a comeback. The second game will be played on September 19 & 20. Mukai to Challenge for Women’s Honinbo Title: Mukai Chiaki 5-dan will make her third challenge for the Women’s Honinbo title and her sixth challenge overall to women’s triple crown holder Xie Yimin. So far she has been frustrated by Xie’s fighting strength, which is unmatched among women players in Japan, but Mukai is clearly the number two player here, so competing with Xie is her destiny. She will surely be encouraged by her success early this year: although Japan took only third place in the 2nd Huading Cup in late April, Mukai won all three of her games and helped Japan to a rare team win over China. In the play-off to decide the challenger, held on August 29, Mukai (W) beat Chinen Kaori 4P by resignation. She previously challenged for this title in 2010 and 2011, losing 0-3 and 1-3 respectively. Japanese Players Eliminated from Samsung Cup: A report on the opening round mini-tournament that starts off the Samsung Cup has already appeared in this journal. Here are the details of the Japanese players’ results. There were two seeded players in the main tournament, Takao Shinji and Yuki Satoshi, who were joined by Komatsu Hideki, winner of a seat in the veterans’ section of the qualifying tournament. In the first round, the Samsung Cup is divided into eight groups of four players; they play each other until a player qualifies for the second round with two wins or is eliminated with two losses. Game 1 (Sept. 3). Komatsu (W) d. Eric Lui (USA) by resig. ; Gu Lingyi 5P (China) (B) d. Takao by resig. ; Gu Li 9P (China) (W) d. Yuki by resig. Game 2 (Sept. 4). Fan Yunruo 4P (China) (W) d. Takao by resig. ; Chen Yaoye 9P (China) (B) d. Komatsu by resig. ; Liao Xingwen 5P (W) d. Yuki by resig. Game 3 (Sept. 5). Yi Se-tol 9P (Korea) (B) d. Komatsu by resig. Young Players Gain Honinbo Seats and Promotions: Every year there is a radical turnover in the Honinbo League: four players out of eight lose their seats, compared to only three out of nine in the Meijin League and four out of twelve in the Kisei Leagues. That means, in theory, that there’s a little more scope for new young stars to make their debut in this league. That’s certainly how things have turned out this year, with two teenagers and two veterans joining the 69th league. The first three of the play-offs for the places up for grabs were held on August 29. Kono Rin 9P, who recently came very close to taking the Gosei title from Iyama Yuta, defeated Yamashiro Hiroshi 9P (B) by 1.5 points. At 32, Kono qualifies as one of the veterans. The other veteran is Sakai Hideyuki 8P, aged 40. Taking white, Sakai beat his fellow Kansai Ki-in player Imamura Toshiya 9P by 7.5 points. 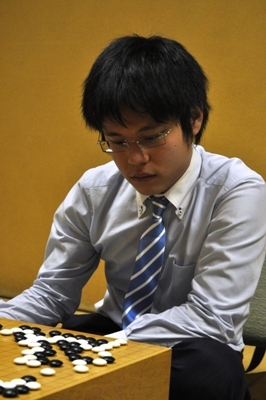 Sakai has played in eight Meijin leagues, but this will be his first Honinbo league. The third player to win a seat on the 29th was Yo Seiki 3P (right). The 18-year-old Yo (B) beat Han Zenki 8P by 8.5 points. Yo is a player who has been attracting attention as a possible future star for the better part of a year now. Born in Taiwan on July 6, 1995, he became a professional at the Taiwanese Qiyuan (Ki-in), reaching 2P, but then switched to the Kansai Ki-in, where he started out as a 1-dan in 2009. He quickly established himself as a worthy successor — and now a rival — to the Kansai Ki-in’s top young player, Murakawa Daisuke 7P (born on December 14, 1990). Yo has been sweeping all before him this year, winning 18 games in a row before losing in the semifinals of the Tengen tournament (see our previous report). He has also reached the final of the 38th King of the New Stars tournament. In the second round of the current NHK Cup, he scored a very impressive win over Cho U, impressive especially because of how strongly he fought back after incurring a slight disadvantage in the opening. Already some go reporters are talking of him as a future rival to Iyama, and not in the very distant future, either. Yo set a new record by becoming the youngest player to win a seat in the Honinbo League; the previous record was 20 years two months, set by Iyama. The latter’s record for any league — 17 years ten months in the Kisei Leagues — remains intact. The final play-off for a league seat was held on September 5; Ida Atsushi 4P beat Cho Sonjin 9P, so he also makes his league debut. He is almost as young as Yo, having been born on March 15, 1994 and if his game had been held before Yo’s, he would have temporarily held the record. A member of the Nagoya branch of the Nihon Ki-in, that is, the Central Japan Headquarters, Ida has also attracted attention as an up-and-coming player. One of the advantages of winning a seat in a league (or a title) for a young player is gaining an automatic promotion (it usually takes effect the next day). When Iyama won the Agon Kiriyama Cup at the age of 16 in 2005, he went from 4P to 7P, then to 8P for becoming the Meijin challenger in 2008, then to 9P for winning the Meijin title the following year. Ko Iso also went from 4P to 7P when he won a place in the Meijin League in 2005. Ri Ishu and Uchida Shuhei have also won such promotions in recent years. In a sense, they are a bonus attached to a more substantial achievement than a mere promotion. In any case, Yo is the first player in Japan to jump four ranks, so he has another record. 38th Kisei Leagues: Murakawa Wins B League: Two games were played in the B League last week. Murakawa Daisuke 7P of the Kansai Ki-in, who already had the sole lead, put himself in an unassailable position by beating Kono Rin 9P. Every other player already has at least two losses, so Murakawa wins the league regardless of the results in the final round. He will meet the winner of the A League in a play-off to decide the challenger to Iyama Yuta Kisei; in that league Yamashita Keigo has a slight edge, but Kiyonari Tetsuya 9P, Yoda Norimoto 9P, Yamashiro Hiroshi 9P, and Kobayashi Satoru 9P are all still in the running (Cho U is the only one completely out of the running). (September 5) Hane Naoki (W) defeated Cho Chikun by resignation; Murakawa Daisuke (B) d. Kono Rin by resig. Women’s Meijin League: One game has been played in the 26th Women’s Meijin League since our last report. On September 5, Chinen Kaori 4P (B) beat Mukai Chiaki 5P by 2.5 points. With two losses, Mukai falls behind the pace. Joint leaders, both on 3-0, are Kato Keiko 6P and Suzuki Ayumi 6P. Iyama’s Successive Title Matches: In our previous report, we mentioned that Iyama Yuta (right) would set a new record by playing in all the top-seven title matches this year. That is true, but actually he has played in all top-seven title matches since last year’s Oza and his run will continue to next year’s Kisei title match, so he is already guaranteed to set a record of appearing in ten title matches in a row. If Iyama wins the ongoing Meijin title match, he will become the second player after Cho Chikun to hold the big triple crown of Kisei, Meijin, and Honinbo. Cho did this four times, in 1983 and 1996 to 1998.